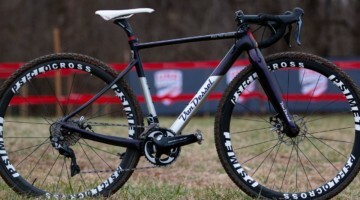 Van Dessel has become a popular choice among ’crossers. Offering two distinct models, the aluminum Holeshot and the carbon-stayed Gin and Trombones, Van Dessels have been seen under riders ranging from weekend warriors to national contenders like Adam Myerson and Junior sensation Jeff Bahnson. The small company based in New Jersey has established a loyal following with a reputation for good products and customer service. And now Van Dessel is taking another step forward by offering the company’s first all-carbon ’cross bike, the Full Tilt Boogie. 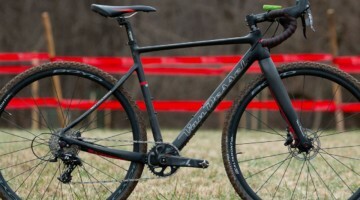 Two years of development resulted in the introduction of Van Dessel Cycles’ full-carbon cyclocross race bike, called the “Full Tilt Boogie.” The bike takes its design cues from Van Dessel’s veteran Gin & Trombones ’cross bike and, for the carbon fiber skeptics that lurk among us, the Full Tilt Boogie even has some built in “insurance” when it comes to crashes. “The Full Tilt Boogie is an absolute pure race bike with no compromises and everything 100 percent focused on going as fast as possible,” remarked Edwin Bull, founder and president of Van Dessel. Aside from making sure the bike performs when the start whistle blows, racers know that in ‘cross, accidents do happen, which is why the top tube has a heavily reinforced center section where bars can hit. A reduced wall diameter allows for increased wall thickness and, given that carbon’s known “Achilles-heel” is its diminished strength against impact, and the fact that crashes happen, Van Dessel will be offering a generous no-fault crash-replacement policy. Midway through last season, racer and lightning bolt industry influencer, Adam Myerson, modified his Gin & Trombones cable routing with power tools so that the housing runs from the top tube all the way to the rear derailleur. [See Dave Drumm’s article for Cyclocross Magazine on how to customize this for your own rig] The motive was to keep the rear derailleur free of grit, water, sand, and mud while maintaining smooth shifting. 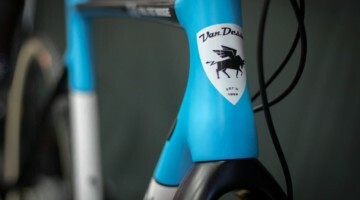 Van Dessel’s other elite guys followed suit and now “Myersonian routing” is stock on all of Van Dessel’s new ’cross frames. 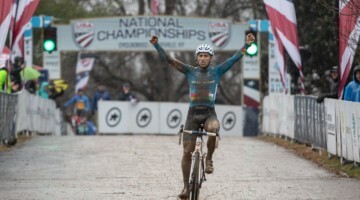 On the athlete front, Myerson has re-signed with Van Dessel. He will be joined by Bill Elliston (Elite/35+), Gui Nelessen (Elite), Fred Wittwer (Masters), Mark Kutney (Masters) and multi-time national ’cross champ, Jeff Bahnson (Junior), who will be heading up the Van Dessel Factory Team this season for a full tour of the US Gran Prix races, Nationals, as well as every regional race they can enter. The Full Tilt Boogie will be available mid August and will come in five sizes: 50, 52, 54, 56, and 58 cm. The bikes will be spec’d with matching custom “Flanders yellow” TRP EuroX brakes, and all complete bikes will be outfitted with Vittoria XM tubulars. All bikes are available in any and all component groups from SRAM, Shimano, and Campagnolo. While we regret that we won’t yet offer the Full Tilt Boogie in 60cm size, the Gin & Trombones has always been offered in a 60cm version. 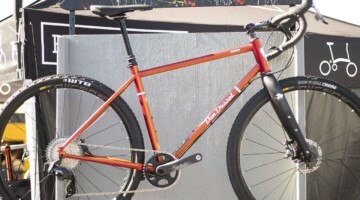 – Complete bikes available with SRAM, Shimano, or Campagnolo builds. Rival shifters, front derailleur, rear derailleur, PC-1030 chain, OG-1070 cassette, TRP EuroX brakes, FSA Gossamer BB30 CX 36tx46t cranks, OS190 stem, Omega handlebar, SL280 post, VDC saddle, Sun Ringle Vista Cruiser 28/32h CX tubular wheels, Vittoria XM tubulars. All Van Dessel complete bikes are always built to order, which means customers can choose stem length, bar width, crank length, cassette gearing, and bar tape color…always. A $400 “performance upgrade” package upgrades stem, bar, and cranks on the above builds to FSA OS99, FSA Energy, Force BB30.